A pyroclastic texture shows a mixture of rock fragments, pumice, and volcanic ash. The ash is very fine grained, so only the rock fragments and pumice are identifiable. A rock with a pyroclastic texture is termed a tuff if the largest fragments are less than 2.5 inches long, a volcanic breccia if the fragments are larger. 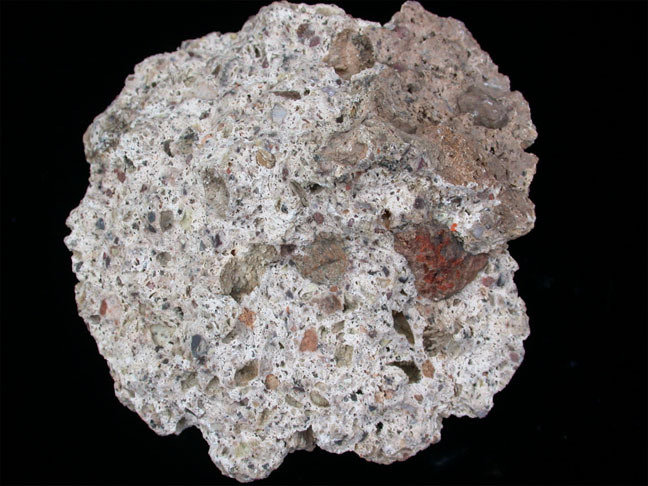 Because tuffs and breccias require lots of ash to form, most tuffs and breccias are intermediate or felsic in composition. The samples shown below are all rhyolite (felsic) tuffs. The pyroclastic texture of most tuffs is not this obvious. 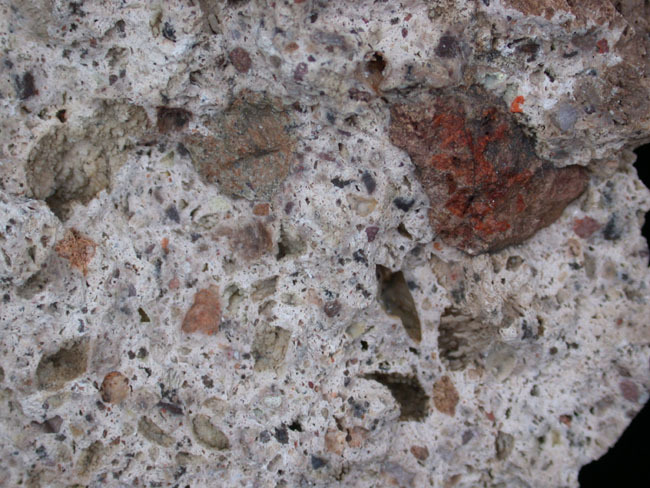 This sample shows excellent color contrast between the various clasts (red, orange, brown, etc.) and the compacted ash (white). This close-up of the sample above shows the angular nature of the clasts (the volcano did explode, after all) and the very fine-grained nature of the ash matrix (white). 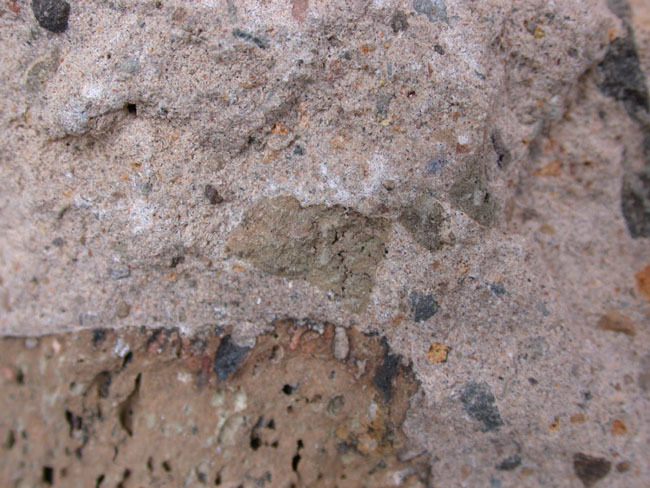 Here is a tuff where the ash has a pinker color, but again the color contrast with the clasts is unusually good. The large brown clast to the lower left is a piece of vesicular basalt from an older section of the volcano. Pyroclastic rocks reveal clues about the long-term volcanic history of an area. 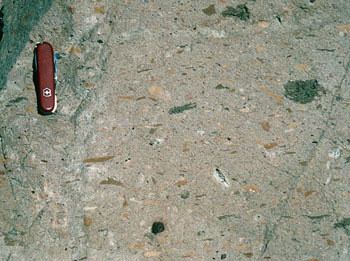 This close up of the above sample emphasizes the angular clasts and the fine-grained ash matrix. 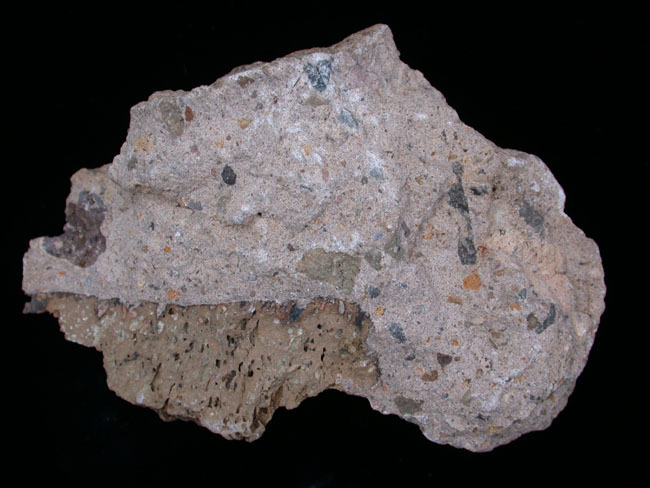 This is a welded tuff. The ash, pumice, and clasts were so hot that they remelted to form a glassy rock after landing on the ground. Most of the thin clasts are pumice blocks that collapsed and flattened as they were reheated. This outcrop is along the Resting Springs Pass, near Death Valley, CA.